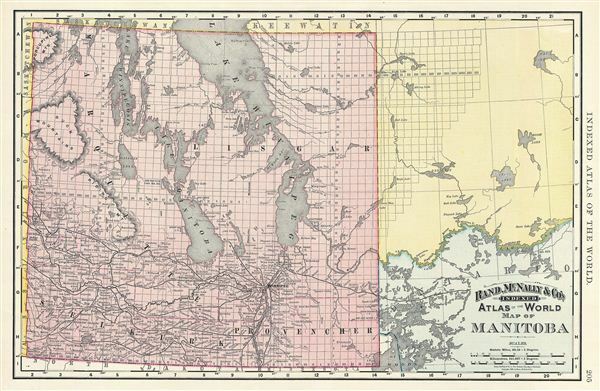 This is a beautiful example of Rand McNally and Company's 1892 map of Manitoba, Canada. It covers only part of modern day Manitoba from the Porcupine Mountains to Provencher. Winipeg, its capital and largest city is identified. Late nineteenth century Manitoba, known as the 'postage stamp province' of Canada was much smaller than its current size. Ontario won large parts of its expanded borders in 1889 and it was only after this time that Manitoba absorbed portions of the Northwest Territories to gain its current size. Color coded according to political boundaries, the map notes several towns, cities, rivers, railroads, lakes and various other topographical details with relief shown by hachure. This map was issued as plate no. 205 in the 1895 issue of Rand McNally and Company's Indexed Atlas of the World - possibly the finest atlas Rand McNally ever issued. Rumsey 3565.058 (1897 edition). Philip (atlases) 1026 (1898 edition).